Being immersed in writing a book is a great experience, but when I’m in between books, I enjoy picking up smaller assignments, especially when I’m asked to write about topics I normally don’t get to indulge in. Over the last six months, I’ve been working on a number of fun plant-related projects for the HGTV website, which has given me the opportunity to experiment with a variety of crafting techniques. 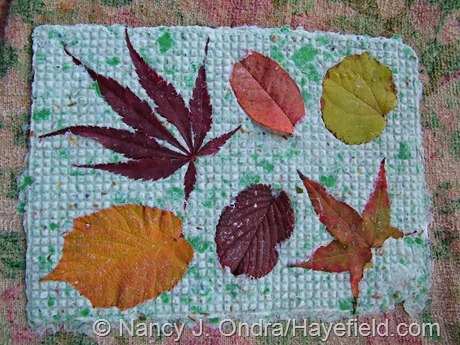 I’ve enjoyed them all, but one of the best ones was learning how to turn some of my favorite garden plants into handmade paper. So, as a change from post after post of endless garden photos, I decided to write up some of the stuff that I didn’t get to include in the finished project, just in case any of you might like to give this a try while there’s still lots of great paper-making material available in the garden.